For instruments using the electrical sensing zone sizing/counting technique (Coulter Principle), it is imperative that the dispersion electrolyte be free of particles. Even electrolyte from a newly opened vessel often contains particle concentrations too high for critical analyses. During analysis, these particles degrade the quality of the analysis. The more sensitive the analyzer, the more pronounced the effect could be. The removal of unwanted particles is, therefore, required to obtain the most reliable particle analysis data possible. 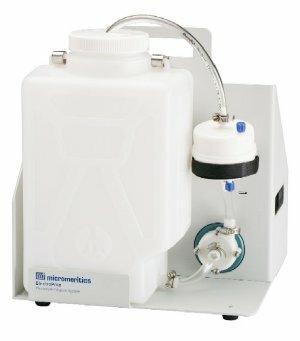 The Micromeritics ElectroPrep is capable of producing a constant supply of filtered electrolyte. The device can ensure that even recycled electrolyte is free of particles. Having the absolute minimum number of background particles is particularly important with low-concentration measurements as even a small amount of electrolyte contamination can affect results. For electrolytes in which sample particles readily disperse (e.g. alumina in saline water) without having to employ an additional dispersing agent, the waste liquid can simply be recirculated back through the ElectroPrep and used again and again. In typical usage under these conditions, one preparation of electrolyte will last several months before the filter cartridge has to be replaced. This is also true of saturated electrolytes. Using the ElectroPrep, it is also possible for a laboratory to produce its own electrolyte that is free of particles at significant savings. The ElectroPrep recirculates electrolyte through a filter cartridge that retains particles greater than 0.1 - 0.2 micrometers in diameter. The device can be utilized with either aqueous or organic electrolytes by selecting the proper filter cartridge. The electrolyte is housed in a 9-liter (2 gallon) container and circulates at a rate up to 0.5 L/min. The ElectroPrep produces a supply of clean electrolyte that ensures a low baseline when conducting particle analyses while also saving a considerable amount on new electrolyte and waste handling.